It’s a peculiar year for a walnut hunter. 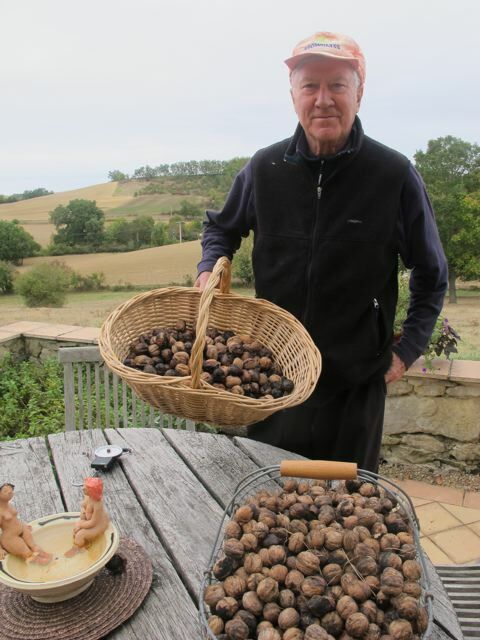 Normally now, in mid-October, the ground would be thick with freshly released clean-looking nuts–asking to be collected. After rainfall is an especially good time–the raindrops knocking the nuts out of the tree. It’s a pleasing pastime–with rich pickin’s! There’s no lack of walnuts but they are falling late–often after the leaves, giving the trees a rather spooky look. When they fall the nuts are staying untidily in their casings. I come home from walnuting with tell-tale fingers–stained brown from trying to prise out the nuts. A give-away–if I were doing something wrong. This reminds me of a mulberry tree in Delphi, Greece in 1961! The summer of that year my school friend Chris Fordyce and I were hitching round Europe for nine weeks before going to university. We’d been dropped on a corner just outside the then unspoilt town (the youth hostel was half built! )–under the shade of a mulberry tree laden with berries–ripe for the picking. We were hungry and given the setting–decided it was a gift from Apollo. We reached up to feast on this glorious fruit but soon realised as the mulberry juice ran over our outstretched fingers and up our arms, staining them red, that if challenged by the owner of the tree we would find it impossible to deny the self-evident truth–that we’d been stealing his fruit. Fast forward to the present and local wisdom has the lack of rain’s to blame for this unusual walnut year. Not enough moisture rising in the tree to pop open the casing cleanly and push the nuts out for me to scoop up gratefully. It’s taking the fun out of it. None the less–I shouldn’t be complaining! "It's that man again--collecting his nuts!" My Weight Watchers magazine says that the University of Toronto found that when people with Type 2 diabetes added about 1/2 Cup of unsalted mixed nuts to their daily diet, both blood sugar and “bad” cholesterol levels decreased slightly. PS Who are the well endowed ladies on the table? Walnuts and almonds are particularly good I’m told. I never got their names–but it must be getting a bit chilly mid-October nights! For a moment there, I thought “Walnuts” and “Almonds” were the names of the two well endowed ladies on the table! You are so lucky to able to pick the nuts right off the tree’s I love walnuts,I take every opportunity, to use them, though I do have to buy them. No, we never encountered the owner of the tree–lucky for us! on October 18, 2011 at 11:15 am | Reply Dianne P.
You’re starting to look a bit chilled over there, Robin! PS: Got the dates yet for your US visit? I have just got back from a month in Australia, so had a lovely time catching up with your blog. This post reminded me of ‘scrumping’ pears as a teenager, and feeling guilty even though the fruit dangled temptingly over the wall and often, when very ripe, fell on the pavement. I came across a magazine in Oz, entitled ‘Better Homes and Gardens – Diabetic Living’, which had in it an article, ‘Type II – the new cure; is it for you?’. I cannot access it online, and as I am not myself diabetic, did not get the magazine. However, if there really is a ‘new cure’, why have we not heard about it? You are much better informed than me about the condition, but thought you might be interested. I think the mag. is available through Amazon. Thank you very much for signing the books for me in Truro – it was lovely to meet you and Meredith. Hope you enjoyed your time in Cornwall. Come again soon. I’m not aware of a “cure”, Sophie-Jane. Thanks for the tip–I’ll see if I can source the piece. We liked Truro and had a lovely time in Cornwall–a pleasure to meet you too. 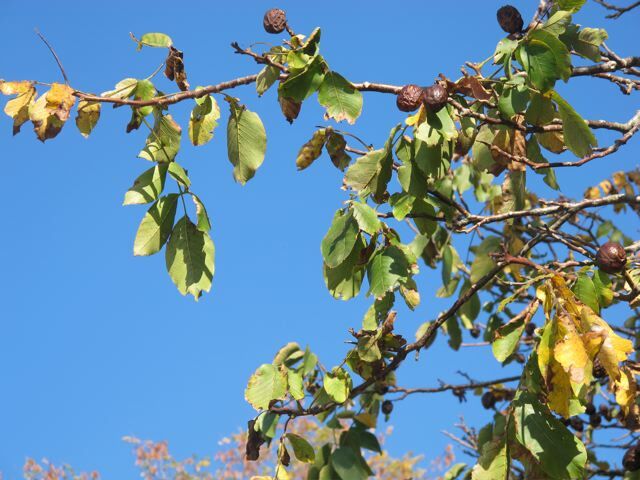 Our walnut trees here in Quercy/Rouergue look just like yours. 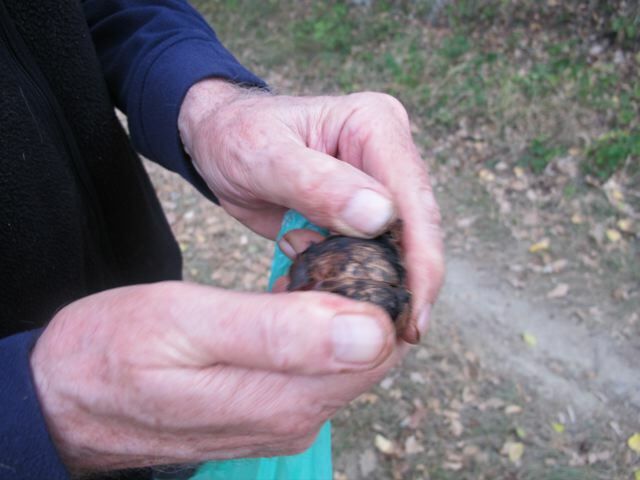 Instead of splitting to release the nut the casings are rotting. And you should have seen my fingers after prising hundreds out – just like nicotine stains. The nuts seem OK, though. Have you tried walnut wine – made in June with the whole nuts, casings and all? It’s a popular apero round here. Nice idea, thanks–I’ll look into it for next year. I suppose it might be a bit sweet for diabetics?–good for guests though. Oh gosh, yes, all that sugar. I didn’t consider that, which just shows how unthinking we non-diabetics can be. I hope you can drink wine. Une vie sans vin serait unsupportable! I drink red wine in the evening [“in moderation” bien sur! ].